Everyone adores Gloria, and I do mean everyone. After all, she is the nice one, the good friend. She gives children unconditional love. Do you know that Gloria has a journal? It is well-worn from love. 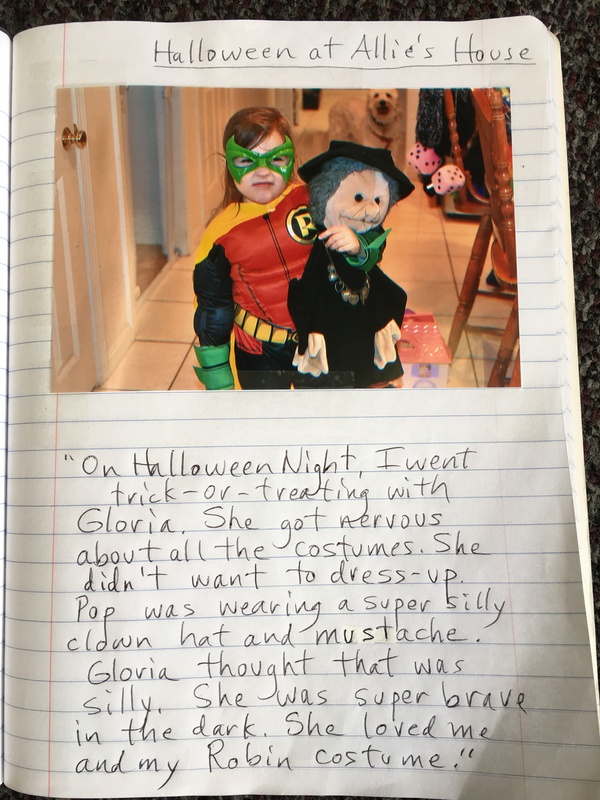 When children take Gloria home for the weekend, they write about their adventures in her journal, often including a photo. We read her stories aloud to everyone. Gloria has more of a social life than I do. She attends graduations, high school basketball games, and Birthday parties. She spends holidays with families, including helping to decorate the Christmas tree. She goes sledding, climbs trees, and plays in the park. Friendships develop at different levels. And, some children have a closer bond with Gloria. Allie does. Allie was over the moon to have Gloria visit with us this weekend. Gloria enjoyed having breakfast, lunch, and dinner at the table. She and Allie and Richie enjoyed playing together and watching the Halloween decorations emerge from their attic boxes! What fun! Gloria also got to meet Jordan as it was Family Weekend at the University of Rhode Island. Gloria and Allie loved walking around the pretty campus. Everyone got to see Jordan’s Sorority House and enjoy a great barbecue. We then went to see her dormitory. She calls it a dorm. It was fun to climb on her bed on risers and twinkling lights! Many people were interested in Gloria and many thought she was something she was not. Allie firmly, but kindly told them about who she really was… an Aqua Roomer, good friend, and one of the best weekend visitors. 🙂 Thanks, Gloria! My goodness! When I read aloud this journal entry to the class, I wasn’t prepared for the wave of emotion that made my words break and crackle. Always happens when you least expect it, especially with Gloria. Remember, she is very real to the children and a perfect ‘tool’ in order to teach diversity: looks can be deceiving, so children need to see what is on the inside and not on the outside. On Halloween Night I went trick-or-treating with Gloria. She got nervous about all the costumes. She didn’t want to dress-up. Pop was wearing a super silly clown hat and mustache. Gloria thought that was silly. She was super brave in the dark. She loved me and my Robin costume. Thank you, Gloria, for all you give to children. Because of you, their hearts are bigger and they are wise beyond their years. You are my hero. This entry was posted in Diversity, Early Education, Giving, Gloria, Kindness, Love, self esteem, Teaching young children and tagged Early Education, Giving, Gloria, Kindness, listening to children, Love, Making a Difference, self esteem, Teaching Diversity, teaching young children. Bookmark the permalink. I love your stories about Gloria! This was really a beautiful story. I liked the part about teaching diversity, and not judging others by their looks. We had our grandchild this past weekend, and she loves a doll we have, which is old and worn, and has a silly face. Thanks for a great read. What a delightful post. I’ve read about these but never followed it. What a fun experience for everyone–including Gloria! Thanks, Jacqui. She is truly fun, and good for everyone! Everything to do with Gloria is always such a joy to read. Looks like she had a wonderful time with Allie! Thank you, Pete. She definitely had a wonderful time with Allie. Best to you! She is, Luanne. Many thanks! Gloria is a wonderful idea, Jennie. Lovely to read how the children bond with her. Thank you, Robbie. She’s a gem! I got choked up reading that story. What a beautiful lesson for your students! Precious. I love her, too. Gloria as a teaching tool is pure genius, Jennie! Thanks, John. She is a gem! Aw, Gloria is SO special. What a great opportunity for children to spread kindness, even to those who may appear different from themselves. Thanks, Marcia. Gloria is fabulous, and brings diversity as well as kindness into the classroom. Gloria IS the kind of hero we need in our world today. Thank you Gloria, for who you are!